We've covered this information before but it remains important to understand just how the H5N1 virus is able to do so much damage, so quickly, to the bodies it infects. The story below also contains one of the first descriptions we've found of a possibly effective 'two-punch' drug combination to kill off the virus after infection takes place. While in Bali last month, I saw a doctor interviewed on television mention that the 'two-punch' combo of drugs had been used on patients during the last 'familial cluster' outbreak in Indonesia, but I haven't been able to find a confirmation of that in any online publications or research papers. THE “Spanish” flu that killed up to 50 million people in 1918-19 owed its peculiarly devastating symptoms to a huge overreaction by the body’s own defences, research suggests. 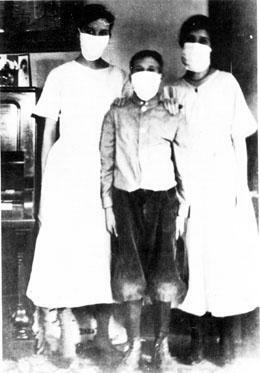 Analysis of the re-created 1918 virus has already established that it has similarities to H5N1, although it belongs to a different strain, H1N1. The Spanish flu triggered a much more extreme immune reaction in the animals’ lungs, activating genes that kill off infected cells in order to clear the body of disease. While this response is normally a critical part of the body’s defences against infection, when it is too strong it can cause as much damage as the disease itself. This could explain why the 1918 virus was so lethal. “What we think is happening is that the host’s inflammatory response is being highly activated by the virus, and that response is making the virus much more damaging to the host,” Dr Kash said. By understanding how this immune overreaction takes place, the researchers hope that they may be able to find a way of damping it down, so that infections with virulent forms of flu do not harm the patient. A parallel treatment strategy could then be adopted: an antiviral drug, such as Tamiflu, would be given to kill the virus, while an anti-inflammatory was used to temper the immune system’s activity. Why Did The 'Spanish Flu' Kill So Quickly?